As the school year draws to a close, many parents face the question of whether their children can be left home alone during the day in the summer months. Pennsylvania, like the majority of states, has no law on the subject, according to Susan Rzucidlo, pediatric trauma and injury prevention program manager at Penn State Hershey Children’s Hospital and coordinator of Safe Kids Dauphin County. The National Safe Kids campaign suggests that children younger than 13 shouldn’t be left alone, but there are qualifiers. Most guidelines indicate that a seven-year-old could probably stay home alone safely while you run a 20-minute errand. If the child is 10 or younger, an hour or two might be the longest you’d want to leave them. For children ages 10 to 12, it depends on the child. Parents should consider the child’s maturity level, behavior, and emotional readiness before making a decision. Also, how does the child feel about such an arrangement? Before giving it a try, the American Academy of Child and Adolescent Psychiatry suggests parents spend time talking about expectations for the time alone. What is and isn’t OK for them to do? How would they handle certain situations? Maybe do some role playing with your child. “Maybe a 13-year-old can use the microwave, but would you want them using the stove or baking cookies? What would they do if someone comes to the door? If there were a fire or they were to cut themselves?” Rzucidlo asks. It’s also important to consider sibling interactions. A 13-year-old who might be fine on his or her own at home might end up fighting with a younger brother or sister left in his or her care. And would the child be allowed to go places? To have friends over while you are gone? Or to go to the homes of their friends? “You could have certain rules when you are there, but you might need to be more explicit about what you want when you aren’t there,” Rzucidlo says. The Red Cross offers safe sitters programs that teach children ages 11 to 13 what to do in an emergency and how to handle younger siblings who may be at a different stage developmentally. Kids can also take a hands-free CPR class. “That’s not a bad thing to learn anyway,” Rzucidlo says. If you and your child don’t feel comfortable with the arrangement, it’s wise to consider alternatives. Maybe a sitter could come in just for the afternoon, once the child has gotten up, dressed, eaten breakfast and completed any household chores? Maybe the child takes turns staying with different neighbors and friends so they have someone to do things and adult supervision? Rzucidlo suggests looking into free programs such as Vacation Bible School or other activities offered by local organizations and community groups. Many local recreation departments offer free or low-cost summer programs for children of all ages. 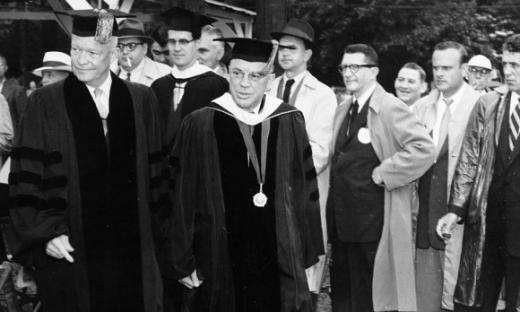 NPR has reminded us that Penn State used to have really good commencement speakers, ranking President Dwight Eisenhower’s 1955 address as one of the nation’s best ever. The nation’s 34th president spoke here on June 11, 1955, during his first term, becoming an honorary member of the Class of 1955.